All four of your kiddos lines up neatly on your finger. 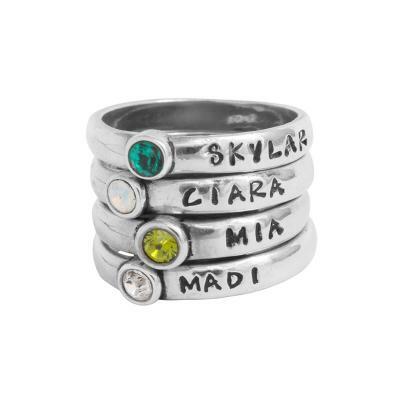 This set of four birthstone name rings makes a statement about who you love. All four of your children neatly lined up on your finger. This set of four birthstone name rings makes a statement with just the right amount of sparkle. I love these rings. These are the second purchase with Nelle & Lizzy. I was disappointed when one of the stones fell out. I waited for a label to send it back and get fixed but I never did get it. A little drop of super glue and it has stayed it. I wear them every time I go out and thinking of getting another to be able to change it up. I ordered these rings as a gift for my wife. They are well made and very nice looking. The only issue is that I ordered size nine rings but these appear to be 9.5 maybe even 10.